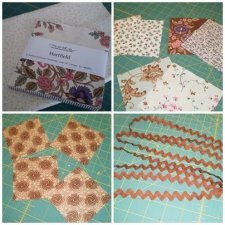 "I'd like to share a quick and easy table topper I made from a Moda charm pack, 2 yards of 1/2" (or 5/8") ric rac, and 7/8 yard of fabric for backing and binding. I used a Hartfield charm pack and some Moda Simplicity for my backing/binding. Before beginning: Choose eight charm squares that will make up your eight four-patch blocks. 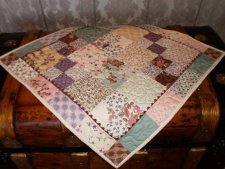 Choose one charm square and cut into 4-2 1/2" squares for the corners of your border. Choose an additional 8 charm squares that you will cut into 16 2 1/2" x 4 1/2" rectangles for the border. Choose 8 charm squares and trim to 4 1/2" square for the alternating blocks. Cut 4 - 18" lengths of ric rac...Now you're ready to begin!"